Comprehensive review of Rally Capsules. See what real experts and actual users have to say about this hangover cure. 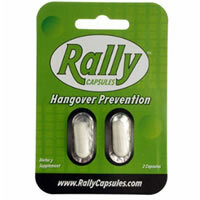 Rally Capsules are a great way to prevent symptoms of a hangover. They are so easy to use! You simple take the capsules before bed with a full glass of water. I didn’t experience any side effects from using them, which is totally awesome. Best of all, the morning after drinking I woke up without any major hangover symptoms. They are extremely affordable, but unfortunately there’s no guarantee, which is a downside. The capsules come in packages of two. You should take 2 capsules after your last drink or right before bed. It’s so easy to use these capsules because you only need to take them right before bed with a glass of water. They aren’t TOO big and are easy to swallow. There isn’t a taste or smell with these capsules, which I really like. They are pretty average size and are easy to swallow, so there isn’t any trouble in taking the pills before bed. I used these pills after a day of drinking at a baseball game. The next morning, I woke up a little tired, but surprisingly had no headache. I really didn’t have any hangover symptoms, which was completely AMAZING. I wasn’t expecting the capsules to produce such great results. Rally Capsules contain a bunch of vitamins and antioxidants. The major antioxidant used is Dihydromyricetin (DHM), which is believed to help alcohol metabolism. The capsules also contain B vitamins, which are believed to aid in energy levels, metabolism, and the immune system. I didn’t feel any side effects from this product, which is a major upside! I’ve tried hangover cures in “pill” form before that gave me a huge stomachache. Rally Capsules costs $17.99 for 10 packages (of two capsules each) on their website. That works out to about $1.80 per package. The price is extremely affordable and inexpensive! There is no guarantee offered for this product. It’s a shame because it would be nice to know that the company stands behind their product with a solid guarantee.